Churches use many apps for presenting media, tracking membership, helping with budgets, and even updating their websites. Some churches also offer a church app primarily for people who attend their church. They contract with a church app provider to make an app that is branded for their church and focused on the needs of people in the pews. These forward-facing church apps help the church communicate with their members, guests, and community and, in turn, offer opportunities for church members and attendees to communicate with the staff. Ease of Use – How much expertise and technical skill does the user need? Platform Support – Will it work on an iPhone, iPad, Android and maybe even other mobile devices? Setup Process – What is the setup process like? Cost – How much does it cost and can medium or smaller churches afford it? Features – Does the service offer the kinds of features users will want? Aware3 is a church app company that focuses on three areas of interaction, which they call connection, communication, and generosity. To that end, they offer ways to connect with the members and the church, two-way communication between people and their staff, and in-app donations. Potential users can schedule a demonstration where a member of the Aware3 staff will walk the user through the setup process and show them how the backend works. This backend lets users control their app and add or subtract various features. You won’t get much of a look at the features from the backside without scheduling a demo. You can, however, download examples from churches that use Aware3 for their church apps. They run on both iOS and Android. Aware3 charges on a monthly or annual basis giving users the opportunity to save some money if they pay for 12 months in advance. The starter plan starts at $69/month billed annually. A Basic plan costs $148/month and the Standard level costs $219/month. That’s a pretty big upgrade from when we last rounded up the best church apps. If you want to pay monthly, prices increase to $158 and $239. These three are included in the more expensive Standard plan. 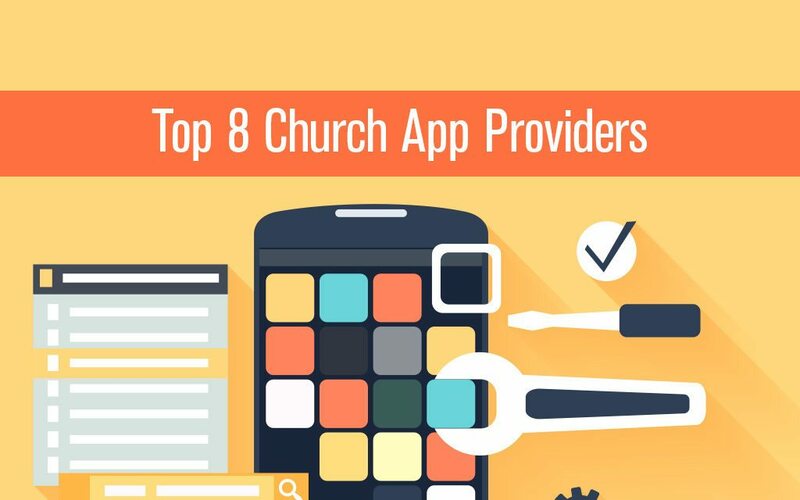 Of all the church app builders, The Church App offers the most platform support. Churches can create apps for iPhone, iPad, and Android like the others. Add Windows Phone, Kindle and Blackberry to the list as well. Plus they now offer a Roku TV app. The Church App integrates with SubSplash, the company’s video streaming system, to connect to YouTube and Vimeo for great video presentations inside their apps. In addition, churches can stream their sermons or other audio via the apps. The user can cast the video and audio to a Google Chromecast or Apple TV. The Church App also integrates Event calendars with links to maps, letting people see contact information about the event, and will send out push notifications about events or other important messages and reminders to users. Does your church have a really great worship band or choir? Maybe you have a talented group of musicians who produce their own music. Add albums and album artwork to music for listening. The staff can share their blogs from the church website and the app also includes integration of the ESV. Unfortunately, that’s the only translation. When the pastor is preaching, he can add fill-in sermon notes too. The Church App doesn’t advertise their pricing. You will need to contact the company for custom pricing. If you want to use their multimedia tools, it will cost $20/month. They also offer church giving services for free, but charge per transaction at about 3% or less. Essentially you’re getting a church app ecosystem that will work on all the platforms that people use to communicate. Log into the site and you’ll see a user interface that looks familiar with navigation along the left side. There’s also a drop-down box at the top left that the user clicks to go from the app setup to giving, to manage your content like sermons, and a site to manage a website that works with the same content you include in the app. Users don’t have to use Church Base’s websites, but if you want to you can and it syncs content between the site and the app. The app also includes a Bible, Prayer Wall, Sermon Notes with Fill-In the blank, team chat, forms, and more. These features are set up automatically. The service includes the ability to send push notifications. Organize these in the second tab across the top of the page (see above). Church Base offers a user management page where you can work with those who register to use your app and your giving; the user accounts are synced between the app and your giving suite. Click the third tab across the top (#1 above). Then find the button to add users. The middle button lets you add users to groups, like specific classes, leaders, security teams or home groups. Finally, the Topics section allows users to subscribe themselves to certain push notification topics, like bible studies and public events. The member doesn’t sign up for a topic, but the app’s organizer will add people to a topic, like parents or mature believers. A church can organize a team of managers in the Settings (upper right corner). That’s also where you handle subscription to the Church Base suite. The service will cost $99/month for an app for your church. There’s a $399 setup fee. Get a website for $39/month and another $399 setup. You can get both plus online giving for $129/month with a $699 setup fee. If you choose to pay annually instead of monthly, you waive all setup fees, saving you up to $699. If you want Church Base to build your website for you then it costs another $599 initially. Custom Church Apps offers benefits to potential users by offering a free 30-day trial. It is the only service where churches can get an app designed for them and have full access without paying a dime. Churches will need to sign up with a credit card, and they can get started by making a few simple choices. The company will get you started building your app right away. I set up my church app by answering a few questions and then chose the style and features I wanted. They worked on building the app and contacted me to make sure I didn’t have any special needs. The basic plan costs $29.95/month with no setup fee – if you have simple needs and already have an online giving service. You can add custom forms for things like guests, new members, prayer requests, and more. It will cost you $59.95/month. Pricing is based on the number of church attendees and full details are available here. The service can integrate Proclaim signals from Faithlife’s worship presentation service. This lets users see content on their phones when doing presentations in church using Proclaim. Other features include online giving, note taking integration, podcasts for sermons or other media, digital Bible integration, an online store for music, and more. Custom Church Apps builds apps for both iOS and Android. If you want to see some iOS examples, see their listing of Custom Church Apps for iPhone or iPad. Here’s the list of Android examples. One of the best values in church apps comes from Ministry One. They wanted to make the creation of a church app simple and they succeeded. It’s as close to set it and forget it as you come in church app providers. Ministry One will integrate with any of these services. The Ministry One church app service is an add-on to their other services. That means it will help churches interact with members with attendance, keeping track of contact information, handle giving and sign up for events and even pay for the even, plus support the church with their offerings and tithes. Giving – Set up a screen to give tithes or make contributions to special causes or offerings and see giving history. Sermons – Access to sermons from other services like YouTube, Vimeo or one of the Ministry One partners. Events – Set up events for the people to learn about and sign up for. Discover – A kind of landing page where app users can find sermons and events you choose to show. Contact – Create contact forms for things like prayer requests and letting guests give their information. Add all of these sections and then design the app style and color to match your church’s branding. On the screen furthest to the right in the screenshots above you’ll see the messages section. You can send out notifications and schedule them to go at predetermined times. The app user can set up the app to receive them instantly when they come or only when they open the app by turning on or off notifications on their phone. See all of the company’s training videos on Vimeo. The App Store apps, whether you use Android or Apple, work the same except that Apple doesn’t let you take donations within the app without taking 33% for themselves. So the company solves this by using a link in the app to a website where app users can then make donations online. The Pushpay philosophy focuses on giving and community with an app making both easy for churches and users alike. They offer a strong company to make support a benefit. Push Categories: Users can choose to receive certain kinds of updates, like emergency messages, reminders or others. Campus Categories: Multisite churches can let attendees choose to receive notifications from their site instead of from all sites. This could be used to let the folks at each location know that their senior pastor will preach from their location this week. The above video shows the Mobile App Studio. This application allows churches to customize their app with a drag-and-drop user interface in the online control panel where they set up their app. Churches get access to the Mobile App Studio which makes it easy for them to update their app. Pushpay provides personal training for church staff on how to use the MAS during the implementation process. The company prides itself on their security promising PCI Level-1 compliance, meaning they have an outside organization audit their security to ensure customers data gets secured properly. To get the custom church app you’ll need to subscribe to the Advanced or Complete tiers. The lowest level, Core, leaves off the quick polls, sermon notes, Bible reading plans, and responses. Churches will also need to upgrade to Advanced or Complete to get a branded giving experience and custom-giving URL. To see all the differences see their optional tiers see https://pushpay.com/pricing/. To get actual pricing details you’ll need to contact the company directly. The service starts at $200/month. Giving costs include a 1% fee for ACH, 2% for debit cards and 3% for credit cards. The giver can choose to pay that costs instead of passing them along to the church. ShareFaith offers a full suite of church-focused services. I first discovered them as a church graphics supplier. They offer a nice collection of church video loops, background graphics, theme graphics, and videos for worship services and church marketing material. They have added a slew of other services including websites, giving services, Sunday School, VBS lessons, worship presentation software, and now church apps. To subscribe to the ShareFaith Church App, you’ll need a ShareFaith Complete Yearly Membership, which costs $72/month billed annually or $80/month billed monthly. The full services include all the items listed above including the online or app giving service. They also do not charge for startup, which can be a big saving compared to the other services. The ShareFaith Church App Builder looks simple to use. It is not as advanced as other apps and people without a lot of skill or time will appreciate it. Plus the user can create both an iPhone or iPad app as well as Android apps. Tithe.ly church apps have been built to engage people on the go and help your church connect with people through interactive tools. Their focus is on enabling church members to have meaningful interactions by allowing them to take interactive sermon notes, listen to messages on the go, access small group material, check the prayer list, engage with your real-time church news feed, give a donation, and much more. Churches looking for an app can call the Tithe.ly phone line and get a demonstration where a member of the Tithe.ly staff will walk you through the setup process and show you how the backend works. The Tithe.ly church app backend/admin tools allow you to easily update your app, but Tithe.ly’s goal is to build your church an app that you don’t have to spend much time managing. They work hard to feed your app from sources you’re already using such as YouTube, Google Calendar, your website, blog, Facebook, Twitter, and more. One of the best parts of the Tithe.ly church app is that their team does the building for you then trains your team on how to use the admin tools. That way, you’re not spending a lot of time learning the tool on your own. Tithe.ly charges a $149 setup fee and then $59/mo, but you can get your first six months and the setup fee for free right now. You get all the features and will not be charged more for more users or church size. Another option is for a church to contract with an independent developer to create a custom church app for their specific needs. You might have a programmer in your church who’s talented enough to produce a great iPhone, iPad, and Android app. That’s rare, but not impossible. It’s also possible to find a developer who specializes in church app development. If you can’t find a mobile app developer to suit your needs, you might have a website developer who can make a great mobile website for your church that users can use on their phones or tablets as if they have an app. On iOS, you can add a link to the iPhone’s Home screen that behaves like an app. Android has a similar feature, although not as easily. All the church app solutions listed here offer useful features. By evaluating your church’s specific needs in terms of communication, giving, and messaging, you can best determine what solution will work for you. 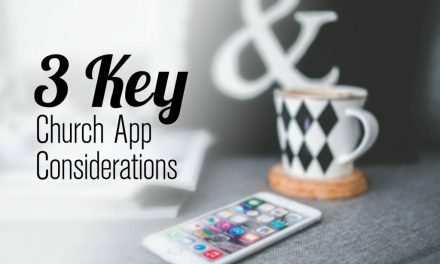 Many of the solutions listed above to have trial offers or conditional periods of service where you can test out the app to make sure it’s going to be the best mobile solution for your church. check out https://www.churchappsuite.com an all in one church app suite. Your intro says you rated the apps based on 5 criteria, but then you listed them alphabetically. There is no “rating” on the list. I’d love to see an actual rating or a spreadsheet with features compared for easy viewing. Thanks for your comment, Kim. Kevin did assess each of the apps based on the same criteria, however, they are not ranked by criteria, they are listed in alpha order. Is there something specific you’re looking for help with? I’ll suggest a ranking system for the future, however, posting a spreadsheet is tough to update as features are constantly changing. We did a spreadsheet-style review of live streaming companies: https://churchtechtoday.com/2016/01/29/10-church-live-streaming-providers-to-consider/ – Is this what you’re looking for? Thanks for your input! Hi guys! Tom, thanks for the quide it looks absolutely must-to-read for anybody who deals with marketing communication in daily routine. What about the others? Did you feel the power of push notifications? Is it really worth trying? What were your inbound rates after implementing marketing automation? Could you, please, share your experience? What about our last discoveries – we were really satisfied with that new tool for churches called Interactio ( more info available upon link https://interactio.io/house-of-worship?src=church ) – in short it’s app designed for churches that are multi-cultural and multi-language, it basically saves your time and input for broadcasting speaker’s speech in real life time to any language you need to any smart device ( smartphone or tablet) just by using headphones, wi-fi & uploaded application. Isn’t that fantastic, is it? So taking into account, this tool can save a lot of investment that previously we spend on communication, planning, ordering & transporting on equipment for our church services. Absolutely added value experience for multi-cultural events and venues. Neil, thanks for the overview. We are on the same page thinking of Aware3 – they have easy-to-use interface navigation, forms and all insides are very well designed for users of different level. So all users can receive their updates or any needed info fast, easy and quick – that’s the perfect match in my opinion. What’s more this app provides smart pushes that’s very handy in some cases, I have no doubts that this notifications are essential, if you’re still wondering its power, strongly suggesting to read this guide https://getfirepush.com/blogs/news/web-push-notifications-acomplete-beginners-guide So what about the others Aware 3 users? Are you satisfied overall? What is your favorite feature?